Not Threatened By Climate Change: Galápagos Islands | Watts Up With That? Rightfully famous for its strangely different flora and fauna, the products of ages of isolation from the mainland of South America and the maybe the seed of inspiration to Charles Darwin’s ideas regarding the evolution of Earth’s plants and animals, the Galápagos Islands are almost exactly on the equator some 600 miles west of Ecuador. The fabled living treasures of this group of islands are threatened, besieged and at risk of disappearing forever long before we have had time to discover all of their secrets. A beautifully illustrated article in the New York Times, featuring the strikingly evocative photography of Josh Haner, warns us how the Galápagos Islands’ ecological niches and their living legends are endangered. “To see the future of the Galápagos, look to their recent past, when one such event bore down on these islands. Warm El Niño waters blocked the rise of nutrients to the surface of the ocean, which caused widespread starvation. Somehow, this destruction and death may have taken place without it coming to your attention. Certainly, with the Galápagos Islands being rated #5 in the 8 Best Ecotourism Destinations In The World, one wonders how the Galápagos maintain their popularity with all those awful things going on. Let me try to untangle the web of this mixture of fact and fallacy. Claim 1: “The world’s oceans have warmed at least half a degree Celsius since then. .” The link is to the Times’ very own really scary story (based on the IPCC’s SR1.5 ) which stated “But as global average temperatures have risen half a degree in that span, these bleaching events [referring to coral bleaching] have become a regular phenomenon.” Let me correct this: ocean temperatures worldwide have not warmed by 0.5°C. On this particular day, 9 March 2019, we see right along the equator off the shore of Ecuador, dark blue (in the little green circle) which represents sea surface temperature between 2 and 3°C (about 5°F) below the 1971-2000 base period. Here’s the last year, with images picked out near the beginning of each month. The SST of the sea surrounding the Galápagos swings over a range of 4 degrees or so during the year. And how about the long term changes? Again, the small circle off the coast of Ecuador shows the location of the Galápagos Islands, sitting just inside the 24°C contour. Comparing the decadal averages we find that there has been no change at the Galápagos since 1955. The fact of the matter is that sea surface temperatures along the equator between South America and Southeast Asia are driven by the phenomena called ENSO — El Niño–Southern Oscillation. Those readers not familiar with the ENSO can watch this short 2 minute video (opens in a new tab or window). The event referred to in the Times is the 1982 major El Niño event which temporarily shut down the upwelling of cooler nutrient rich waters that feed the diverse aquatic life in the Galápagos which resulted in population drops of marine iguanas, seals, and penguins. A similar situation recurred in the 1997-1998 major El Niño event and can reasonably be assumed that this was also repeated every time there was a Major (or Super) El Niño in the past. The Galápagos Islands lie some 600 miles west of the shore of Ecuador and sit straddling the Equator. Five important Pacific Ocean currents meet there: The Panama Current, the nutrient rich Humboldt flows north up the coast of South America and then turns west heading to the Galápagos, where it joins in the westward flowing South Equatorial Current. Slipping along the equator, flowing west to east, is the North Equatorial Countercurrent. “Lastly, and possibly most importantly, is the Cromwell Current, aka the Pacific Equatorial Undercurrent. Until now, we’ve been talking about surface ocean currents, but the Cromwell flows about 300 feet down, from west to east along the equator. When it hits the Galápagos from the west, it’s deflected toward the surface, bringing yet more cool, nutrient-rich water. “ [ source ] Nutrient rich waters increase the plankton growth and that attracts the sardines and other fishes which eat the plankton. El Niño conditions do not “cause rapid, extreme ocean heating across the Eastern Pacific tropics.” (as stated in the NYT) Rather, according to NOAA, an El Niño event is when “huge masses of warm water … slosh east across the Pacific Ocean towards South America.” (well, sort of…) The El Niño is not something that causes heating of the ocean surface, it is an effect of warmer waters moving from the western Pacific to the eastern Pacific, in part by a weakening of the easterly trade winds, which blow east to west. El Niño can be identified by a certain pattern of changed wind and ocean currents — and in fact, there are many sub-classes of El Niños, which each have differing effects on the world’s weather. El Niño’s mass of warm water puts a lid on the normal currents of cold, deep water that typically rise to the surface along the equator and off the coast of Chile and Peru, said Stephanie Uz, ocean scientist at Goddard Space Flight Center in Greenbelt, Maryland. In a process called upwelling, those cold waters normally bring up the nutrients that feed the tiny organisms, which form the base of the food chain. As for the small pelagic fish that depend on those upwellings and the plankton that feed off their nutrient rich waters, they move with the food supply — similar in patterns occur off the west coast of North America. Further complicating the situation for Galápagos seals, flightless cormorants and penguins is that the world’s fisheries experts know that sardine and anchovy populations experience multi-decadal-scale cycles of boom and bust population numbers — which may be somewhat related to ocean temperatures, with sardines preferring warmer waters than anchovies — maybe. Some of the fluctuation may be due to or contributed to by overfishing. The scientific jury is still out on the issue. Anchovies boom while sardines bust, and vice-versa. The patterns seen are similar on the western coasts of North America, South America and Africa, and on the east coast of Japan. CLAIMED THREATS: El Niño is blamed for shrinking marine iguanas (oddly true), damage to Daisy Tree Forests (happened twice in the last 100 years), starving penquins, cormorants and seals, invasive blackberrys, invasive fire ants, damage from rising sea levels. Taking the last of the claims first: Sea Level. Combining Tide Gauge and CGPS data it does not appear that there has been any SLR at the Galápagos over the last 30 years. Bottom Line – Sea Level Rise : Not a current threat to the Galápagos Islands or their flora and fauna. This leaves us with the concerns that El Niño episodes or events will seriously damage the delicate ecological balance of the Galápagos. El Niño events are thought to have been occurring for thousands of years. [ ref. ] For example, it is thought that El Niño affected the ancient Moche people, in what is in modern-day Peru, who may have sacrificed humans in order to try to prevent heavy El Nino rains. There have been at least 30 El Niño events since 1900, with the 1982–83, 1997–98 and 2014–16 events among the strongest on record. Since 2000, El Niño events have been observed in 2002–03, 2004–05, 2006–07, 2009–10 and 2014–16. Typically, this anomaly happens at irregular intervals of two to seven years, and lasts nine months to two years. The average period length is five years. When this warming occurs for seven to nine months, it is classified as El Niño “conditions”; when its duration is longer, it is classified as an El Niño “episode”. As with all analysis of the past, earlier records are likely to have missed weak or short El Niños. For instance, there was a strong El Niño 1931-1932 (which is not shown in the illustration above). Today El Niños are mostly determined by satellite images and measurements. It is impossible, of course, to counter any claim that concerns the future, so we must depend on the past for an idea of how frequent Major, or Super El Niños do occur. Almost all of the Climate Change concern for the Galápagos rests on model predictions of double the number of El Niños and stronger El Niños through the 21st century. 1) When there are future major El Niños, which is almost certain, then there will be starving wildlife (seals, cormorants, penguins and marine iguanas) if and when upwelling slows, waters warm and sardines move to better feeding spots. This is the natural order of things. 2) El Niños in the future will bring more rain to the dry Galápagos, as they have always done, which is good for most of the flora but has some downsides for the some of the fauna like giant tortoises (which prefer dry soil for egg laying). Long rainy seasons can lead to waterlogging of the thin soils which can cause shallow-rooted plants, like the Giant Daisy Tree, to be blown down in storm conditions. 3) El Niños will mean warmer sea surface temperatures by definition, which if high enough, can cause coral bleaching of the reefs around the islands. These real threats from El Niños are no different today than they have been during the known past and we can confidently assume that these threats existed in the more distant past. The ecological niche that is the Galápagos may actually have been created by and depend upon, in part, the cyclical nature of the ENSO, with its El Niños and La Ninas. Bottom Line – El Niños: El Niño is not currently an increased risk for the Galápagos. No evidence exists, other than unreliable model projections, that there will be more or stronger El Niño episodes or events in the future. “….the sheer growth in tourism, which has been fueled, in part, by the growing popularity of both shorter cruises and land-based tourism, has had an undeniable impact on the islands in recent decades. From 1990 to 2013, tourism arrivals increased from around 40,000 to just over 200,000. During that time, the population of the Galápagos increased from around 10,000 to just over 30,000 [currently believed to be 35-40,000], as Ecuadorians from the mainland migrated here in search of jobs and opportunities created, directly and indirectly, by the tourism industry. Too many people — a quarter of a million people per year visit the Galápagos, stay in hotels, eat in restaurants, are taken by excursion boats to visit uninhabited islands, swim with the seals and sea turtles and drop their trash and cigarette butts everywhere. All the natives (nearly 100 percent immigrants — both from mainland Ecuador and the world at large) and the tourists live on 3% of the land in the Galápagos — by decree from the government. That’s a lot of people crammed into a little space. All those tourists means lots of built infrastructure — water treatment plants, electrical generation (diesel fueled), fresh water wells, trash disposal, roads, marinas, hotels — all those tourists need local people to see to their needs and desires. But luckily, this also means lots of tourist dollars, at least some of which remain in Ecuadorian hands. And some of that money goes to fund conservation efforts. Add to the local money grants from the UN and other NGOs, and there is a lot conservation work being done. The islands need it — tagging along with the people came goats, dogs, cats, pigs, donkeys, cattle, chickens and rats — plus a veritable Noah’s Ark of insects and some troublesome plants. The worst of the invasive plants might be a blackberry — which establishes itself in distressed soil, such as storm damaged areas of Giant Daisy Trees forests. The blackberries grow so quickly and so dense that the Giant Daisys cannot reestablish themselves. Of course, feral pigs, goats, donkeys and cattle can nearly denude a whole small island in just a few short years. Tourist dollars have financed elimination schemes (hunting, both from the ground and from helicopters) which have finally been successful on several islands. The government of Ecuador is making bold efforts to get the situation under control: “In 1959, the centenary year of Charles Darwin‘s publication of The Origin of Species, the Ecuadorian government declared 97.5% of the archipelago’s land area a national park, excepting areas already colonised.” Emigration to the Galápagos has been restricted and tourist visits to many sites are being monitored to keep fragile areas from being overrun. 1) The Galápagos Islands have weathered the storms of the Pacific for centuries, probably millennia, and its plants and animals have survived and been shaped by their experiences. They are not threatened in any unusual way in the present or the near future by Climate Change, Sea Level Rise or future El Niños. 2) The real present threats to the treasures of the Galápagos Islands are too many people (both residents and tourists) and the arrival of invasive species over the last 500 years. 3) The Galápagos Islands are home to some magnificent sights and interesting flora and fauna — if you are a Nature enthusiast, it is a great place to get to know. It is better that you visit by proxy and let nature videos and photography inform you. — the Galápagos Islands already have too many visitors. 5) Various NGOs have programs to which you can donate: The Galápagos Conservancy, The Charles Darwin Foundation, and the The Galápagos Conservation Trust. So many of the world’s wonderful places suffer from too much fame and the resulting rush of tourists. Much of the tourism is powered by the desire of the local people to gain financially. Usually the next cycle brings in international travel and hotel conglomerates which insist in building giant hotels and providing all sorts of intrusive services such as guided walking tours, kayaking trips, scuba and snorkeling outings, motor-cat rides — all of which result in degraded environments. Although the government of Ecuador changes every few years, it has made important strides in improving the situation in the Galápagos. The Ecuadorian National Budget includes support for ongoing work in the Galápagos. UNESCO’s declaration of the Galápagos as a World Heritage site in 2007 has brought aid money from the UN and other international environmental organizations. If you have been there recently, let us know in comments what you found. If addressing me, begin your comment with “Kip…” so I’ll be sure to see it. As there is no good theory of why the ENSO occurs, modeling the observed variation would seem to be an exercise in futility. Claiming El Niño is caused by global warming is about as valid as blaming unicorn farts. I agree understanding of the cause of ( or a least the triggering of ) El Nino events is very weak. However, we do know that solar energy enters the ocean during La Nina and moves to the atmosphere during El Nino, ie it is a process of energy throughput, not a pendulum “oscillation”. It is a climatologist’s trick to label every natural variation an “oscillation” because that establishes, without proof, that it is a net zero phenomenon and thus is NOT contributing to global change. As we all know that role is reserved for Satan’s molecule. The Galápagos Islands, nothing to see here either, move along. We were there April 2013 and toured on a 20 passenger boat for a week. Great tour! There were not cigarette butts everywhere. Most of the islands limited the number of people who could go ashore at any one time – that’s why the boat only had 20 passengers. We were with Road Scholar, I’d recommend that tour for anyone. Well, getting on and off the Zodiac boats could be a challenge, but us old folks (that’s who’s on all these tours) did just fine. Steve — Thanks for sharing – and I am gratified that there are not cigarette butts everywhere! I sympathize with the boarding and exiting inflatable boats — my wife and i did so for the 12 years we were in the Caribbean — even when dressed in business clothes (which often had salt water stains). I don’t have Twitter but could some who do at bombard his Twitter with questions referencing your post?! Warren ==> NY Times’ journalists often known when they are mentioned here. Andy Revkin, when he was at the Times, always knew. Anyone reading work for the Times? Do they have a citation robot cruising the web for links to their articles? Our 8 day visit on a boat touring the islands was spectacular and one of our most enjoyable, interesting and memorable trips ever. The trip was in 2008 so it might not be considered “recent”. However there is nothing like the closeness to the extraordinary wildlife that can be achieved then at the Galápagos Islands. Larry ==> Dang! That’s the problem you see? It is such a great place that really does offer the trip of a lifetime. Who can resist? Also there in 2008. Even then, we were asked to stay on the trails and not wander everywhere. Tame wildlife that allowed plenty of excellent close-up photos. Sitting on a landing waiting for a zodiac, a marine iguana came up and stopped right beside me. Main problem then was the large influx of mainland folks coming out to Santa Cruz to find work, though it sounds like this has mostly been stopped. Graeme#4 ==> Ecuador has taken a lot of effective steps — maybe staying ahead of the tsunami of tourists. In such developing nations, frequent changes in government risks backsliding. Kip, we were in the Galapagos for 2 weeks last year on an “around the islands” cruise. I can assure you and followers of this blog, that things are well under control. Ditto to steve’s post above. The local guides never mentioned the word “climate”, or any thing resembling that, in regard to ecological threats, only human threats which are and have, been mitigated by the government. In short, everything is under control and, in my opinion, the Galapagos are not at all threatened any time in the near future. eck ==> Thank you for the up-to-date, Good News! report. It is hard to tell from the press and promotional web sites if the promised mitigation actions are 1) really taking place and 2) if so, that they are having the desired result. The $100 entry/landing fee is a great idea that ensures that the needed funds for mitigation are supplied by those getting the benefit (tourists). One of the current problems that is not yet under control are invasive species — plants, insects, and rats — all arriving, mostly unintended, with human hosts and their supplies. all incoming bags are fumigated and searches are performed on all supplies arriving by ship — including the use of sniffer dogs to sniff out insects! The real fear is that a change in government on the mainland could adversely affect the efforts on the islands. Think Venezuela. Thank you, Kip. Well done…again. The New York Times is a paper strongly driven by Editorial Narratives. Especially in their “Climate” section. It must be difficult for the journalists who are forced to violate the standards of their profession to satisfy their editors. I don’t know but I find that claim a bit hard to swallow. I’d like to see the proof of that one. If true, it follows that given natural climate (actually weather) variability there would be none there in the first place – being so susceptible and all. Mike ==> There is an eye-witness report from a scientist that has been working the Galapagos since about 1980. While the number is suspect, it is true that there was a serious crash in population. What happens is that when strong or super El Nino comes around, there is a thickening of the warm water layer above the normally thin thermocline which shuts down the upwelling of cooler nutrient-rich water — this has a huge effect on the phytoplankton population (it crashes), which means the small plankton-eating fish are forced to move with the food supply (in this case, they move eat and south long the coast of South America). The result is a kind of oceanic desert around the Galapagos Islands — all the smaller schooling fish (sardines/anchovies) have moved away leaving very little food for the piscivores — seals, flightless cormorants, penguins, shore birds, etc. The reassuring fact is that strong El Ninos have been happening, as far as we can tell, for a really long time and all the species we see there today have survived. Tropical brain coral head (with borehole from a scientific study) in Galápagos. It was over 100 feet above sea level. Hmmm. 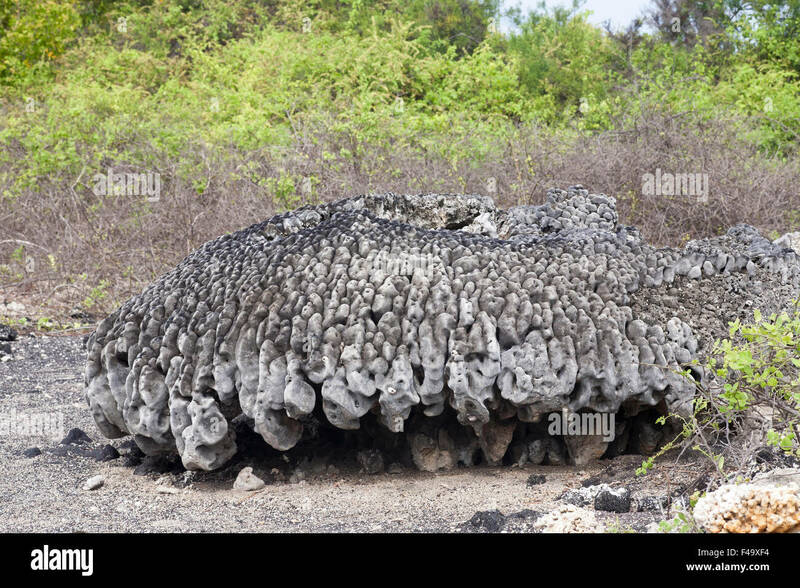 Giant coral head skeleton exposed by rapid coastal seabed uplift of 5m following volcanic activity of Alcedo Volcano in 1954. What happened to the ENSO meter on the home page? It disappeared. …so, how fast can a huge turtle run? tweak ==. The Galapagos are volcanic islands — and the volcanoes are “active” and occasionally give the tourists quite a show. The recently active areas are covered in volcanic flows and don’t support much vegetation — the tortoises live elsewhere. Well knock me over with a penguin’s feather. There are penguins living near the equator? How and when did that happen? It’s great to see that the Galapagos Islands aren’t completely desolate or submerged yet. And one of the islands that support a penguin population is in the northern hemisphere. If you google that fact you will come across Neil deGrasse Tyson getting tripped up on that fact. As to how and when, the Galapagos penguin is most closely related to the Humboldt penguin on the west coast of South America, which breeds as far north as in Peru, so at some time in the past a few penguins must have followed the cool Humboldt current west and happened upon the Galapagos and settled there. As they are closely, but not very closely related it is probably about 4 million years since it happened (which incidentally means that they survived the considerably warmer Pliocene in Galapagos). DocSiders ==> What penguins need is water rich in nutrients that attract lots of small schooling fishes like sardines which must be close enough to shore that the penguins can go out and feed and return to land in reasonable time, especially during the raising of young. They also need a lack of predators on land. There are penguins all along the western shore of South America, north to Ecuador. Penguins lots of places. Yes, the northernmost colonies on Isabela are actually just north of the Equator. They only breed in the parts of archipelago with cooler water. There is a strong temperature gradient between the southern and northern parts of tharchipelago. For example the seabird faunas of e. g. Espanola in the south and Genovesa in the north are very different. We have Penguins in Perth Western Australia, where the high summer temperatures often exceed 40C and are regularly in the high 30s. I took a photo of a Galápagos penguin when there in 2008, by wading out holding my camera above my head, around the base of that volcanic lava cone that often appears in the Galapagos photos. A very special place. Graeme#4 ==> Thanks for the report! Yes, people always just think of Antarctica for penguins. There is a seasonal variation in land height / tectonic isostacy? I never knew! That’s so interesting. I got to thinking about what can cause that. Except sea level change due to wind stacking sea water higher in the western Pacific, I can’t imagine anything. Then I thought about the Sierra Nevada/Cascade ranges in Eastern California / Central Oregon/Washington. Seasonal snow pack this year is about 20 meters. Snow is somewhere around 10% of the density of water, say this 20 meter snow pack is equivalent weight to 2 meters of water. The water would have a mass around 2,000 kg per cubic meter, or 4,000 kg for two cubic meter annual change. The crust under the Sierra Nevada is probably 100km thick, and I don’t know the breakdown if it is 2.6gm/cc for felsic, or 3.0g/cc for mafic, lets say 2.8 for a midway point which isn’t too far outside of reality. 4,000kg on top of 100km * 28000 kg/m3 of crustal rock. The ratio is 24 ppm change in weight on the mantle under the Sierra Nevada range on a seasonal basis. There must be waves within the mantle. There must be a similar effect going on in South America. Is there then a seasonal wave cycling back and forth under the Cordillera between North and South America? This would seem likely! If you’ve ever poured and worked concrete, you’d know there is a liquid creamy “butter” which rises to the surface when working the concrete. The butter develops on the concrete with troweling and makes the surface of the concrete smooth–this is why we trowel concrete. This alternating pumping action on the mantle would probably produce mantle butter which would flow more rapidly within the mantle–especially around the Moho layer, perhaps making the physical Moho–which is separate from the chemical Moho. Could this cause diatremes? Michael ==> Interesting ideas. My suspicion is that the general average temperature causes the mounting point of the CGPS to expand and contract with the relative changes in seasonal temperature. Doubtful. The annual temperature range is only about 5 degrees. The only time there is “real weather” in Galapagos is when there is a big El Nino. The reason the Galapagos was first settled in the 1800’s was that it occurred to somebody that it would be possible to grow and harvest sugar cane all year there since the weather never changed. However when the peons found out that they were supposed to cut sugar cane all year round they killed the plantation owner instead. Present a special session on “Galapagos Islands” at “International Conference on Coastal Ecosystem and Management” to share your views with others in Amsterdam, The Netherlands on September 16-17, 2019. Joel ==> Thanks for the notice of the conference. will it be issuing a synopsis report or a special journal issue on the topics presented? the ancient Moche people, in what is in modern-day Peru, who may have sacrificed humans in order to try to prevent heavy El Nino rains. How little things have changed. There are still primitive people who want to sacrifice our safety and well-being in order to prevent extreme weather events from happening. Maybe the author, Nicholas Casey, meant to write sea surface temperature (SST) has risen half a degree? DWR54 ==> Well, there ya go. Global Average SST is a concept without an application — as it is really the average “sea skin temperature” — the top 2 mm. (Think touching the top of your which has been left parked in the sun — that temperature is not the same as the temperature of the inside of the car — that’s what “skin temperature” is). I give the official graph for 0-700 m ocean water temperatures. Annual average SST in the Galapagos has not changed and is still the same 24°C. There’s also a 0-100m chart available from that same site. Not many of the species mentioned can get below that depth. Why not show that chart? Can you give you link to the Galapagos SST data you reference please? David ==> The stills are from the Operational SST Anomaly Charts for 2019 . I used one still from each month. The decadal climatology images come from this tool @ the National Centers for Environmental Information (formerly the National Oceanographic Data Center (NODC)). The 1982-1983 El Nino created havoc in countries like Peru and northern Chili. We lived at the time in the coastal town of La Serena in the Coquimbo area. We had just moved in and being Dutch were blamed for bringing the bad weather. There was so much rain that all the quebradas, dry riverbeds, filled up to the brim. There were sizeable streams where they didn’t even know that there was a quebrada. People drowned inland in the desert in flashfloods. It was mayhem and lasted several months. When it was over the weather turned to its usual for a semi-desert with one or two measly showers in a year. E J Zuiderwijk ==> Great first hand reporting! El Nino also brings rains to California and the American Southwest… and when it does, there are almost always a few people caught in flash flooding of arroyos in the desert. Is that, like, chili from New Hampshire? Jeff ==> Ed is Dutch, so it is Dutch Chili and he was in dutch for causing the rains on the plains in Chile! EJ ==> Chili Cookoffs are very popular here in the States — and there is also the constant battle between those who think chili should not contain beans and those who allow beans. Thanks for another great post calling BS on the NYTimes. The Times has such outstanding photographic, publishing expertise and money that they can churn out these spectacular photo essays which they use as a platform to try and baffle their readers with climate change BS. Keep up the good work. The Times Climate Change coverage is fertile ground. Mark ==> Thank you….the journalists at the Times may be being required to write to the Editorial Narrative, in this case, on Climate Change. In case anyone doubts the statements above about NYTimes journalists™ being required to follow an editorial narrative, regular including climate change even extends to the NYTimes Sports section. The NYT has had success of late increasing their online subscription readership numbers, quarterly financial results, and stock price compared to dismal results of daily copies of news print delivered and purchased, whether their own or other local newspapers around the country. One wonders if the NYT editorial strategy of constantly pushing the AGW/CCC meme in all columns is related to this corporate marketing strategy to increase on line readership-especially among the Millennial Generation drawn to the Liberal bias of the paper and their constant useage of their smart phones. Gerard ==> The NY Times is one of the newspapers that is managing the shift to the web with some success. If I could, I’d still get the paper-paper — miss the feel and msell of the news. The cool waters around the Galapagos are just about as unaffected by contemporary climate change as it is possible to be. Reason: those are upwelling waters that have been moving through the deep ocean isolated from surface conditions for about 1,000 years. The waters surfacing now “went below” during the MWP, so if anything I would expect the waters to cool a bit in the coming centuries as water from the Little Ice Age starts coming back to the surface. tty ==> The Cromwell Current flows west to east at a depth of about 300 feet. It is not a deep ocean phenomena. And where do you think that cool water is coming from right on the Equator? The deep ocean, that’s where. Kip – great analysis, thanks. The Galapogos top my bucket list. Interesting that there wasn’t much or any landside uplift, given that the Galapagos are all youthful volcanic islands sitting over a hot spot in the mantle. I would have thought there would be some measurable uplift. Maybe the uplift only occurs during a current eruption event? Duane ==> CGPS@TG records for the Galapagos are only ten year long — with some missing data. This is barely enough to “make a guess” at real estimate of average VLM over time. Snay et al (2007) posit that ten years is the minimum for a reliable average VLM calculation. Note that CGPC@TG means “continuously operating GPS station at the tide gauge” — and usually requires the CGPS to be mounted on the same structure as the tide gauge (such as a pier or wharf). This allows the comparison of the two data sets to know what is moving in what directions. There has been active volcanic activity in the Galapagos in the last year or so. There was active volcanic activity when I was there in mid-2008. Couldn’t see it though as it was on an outer island, but some of the small cruise ships were going there. Kip. It has been a while since I was in college, but a classmate from Peru told me that Peruvian government established fishing quotas based on the water temperature in its coastal waters. Peru had the biggest fishing fleet in the world in the 1970s. It still might. Most of the anchovies come from Peru. The water temperature data utilized to establish catch limits must be stored somewhere. Mohatdebos ==> Interesting…I’ll do a ;little searching around on that. the BBC state that climate change caused the recent cyclone disaster in Mozambique; or more accurately it was exacerbated by rising sea levels due to melting icecaps. these latter facts are the ‘undeniable truth’ in the UK. Is this the truth or not becausrgere I understood that the Antarctic ice cap was getting bigger. R Stevenson ==> It is “required” that all weather disasters include a statement of how XXXX was made worse by Climate Change. There is no reliable sea level information for Mozambique at all — no reliable tide gauges …. basically, nothing. PSMSL data for the Indian Ocean shows a remarkably consistent 8-10 inches of RSLR from 1870-1880 across the entire basin. Mario ==> Have a great trip! Would you send me a narrative report about conditions there when you return? email to kip at i4 period net. Thank you for reaching out Kip. I sent you an email. Kip: Your report will arm me against the people who will find anything off in their minds, and then blame AGW. One thing that I find interesting is that at one point goats were brought to one of the islands for a food source, and donkeys for their use, and nearly wiped out the tortoises’ food supply, for which they adapted without competition from such animals. Mario ==> At least two islands have been cleared of feral goats and pigs. But keep an eye out and let me know. We have been to Bahamian islands on which feral goats had eaten most everything, leaving only brush that even they wouldn’t eat – – the locals considered the goats as free food and hunted them for the table (curried goat, jerked goat) which kept the numbers in check. I hope no goats, as they are so, plebeian for these majestic islands… No seriously, this location is one preserve that should be kept that way, as nature created such an isolated mini universe! In the Bahamas, I did something I do not think I will ever be able to do again, which was spent 4 hours in a lagoon for a close encounter with my own rescued female dolphin. She was wonderfully playful, laughing after she spit water in my face as I wiped it. She stood with me belly to belly as I held her flippers and she pushed me too far into the lagoon as I was yelled at for “making her take me too far out”. I have a couple of pics, including one where she pushed me through the lagoon like I was superman. I will never forget that time. Hocus ==> Your location outside of the FEMA Flood Zones along the river? Hi Kip: Just got back and wow, am happy to be able to breath better! Galapagos was like visiting a petting zoo where you are restrained to not touch the animals who seem to WANT to interact with people –and not from being fed food! A natural curiosity, with little fear! First: epiphany in Ecuador’s Quito: I can see why people associate fossil fuels with pollution based on the 3 days of my trip in Ecuador’s Quito. That is, most cars are modern small cars and muni-buses that spew stinky and grossly visible hydro carbons. The air is hard to breath, though the climate is mild, not so humid up at 9 to 10k ft. Hi pollution in an otherwise fairly clean busy environment with lots of traffic. If only the transportation were clean like in the US! Lots of Venezuelan people selling cheap food on corners and highways! Second: The Galapagos weather was warm and very humid, the water was not cold but refreshing felt like 75 to 85 near some shores. Snorkeling with short body suit was very comfortable… sea life was abundant, could see fish spawning inches away, sea lions were playful with humans… sometimes tugging at anything lose on our persons; and birds would do their mating courtships within a few feet of us. They loved being watched… and put on a show for us. Third: I expected to be less heat soaked based on the weather predictions. Every day was mostly sunny… warm all night long in the mid 70’s to mid 80’s day time. Forecast was for rain every day 74F high. It rained one evening. Fourth: Sun was not scorching to my skin because air temp and breeze felt mild… very humid evidently the there is no more seemingly heat radiation energy vs NorCAL but more UV energy between 11 and 1pm… The feeling of intensity was not high outside peak hours which were short at the equator. My skin did not “feel” burning… but a sun burn would evolve quickly where sunscreen wore off. I was conscience of it from what I know. I did not get sunburned or any skin peeling… outside a little red on the top of my feet where the sunscreen wore off from brief use of footwear. This mild burn happened quickly, within 30 minutes to an hour of standing while in the sun on the boat around 12:30pm one day. Fifth: Female tortoises develop when incubated at 39C, males form at 38C. Average in nature is supposedly 37C… Tortoises that I saw were only in tortoise breeding sites on two islands. Wish I had updated sea anomaly charts to see where the surface water temps around Galapagos were during the trip. Sixth: Island tourists levels were well managed to not be crowded! We’d land on the shore to no other people with 18 visitors! The timing of land tours worked well not to feel like we were in a heavily toured place! Seventh: a few islands were populated with farming, lots of buildings, shanty homes, electricity, dogs roaming around… Some cattle! This was surprising to me. Eighth: I saw no penguins, which were on a small island, that we did not visit. Politics of my ship mates. I was in a ship full “18” people. I responded to causally stated memes of extremes from the media. I expected to have contentious conversations, but met some insightful people and feel like I got them to be more skeptical and questioning surrounding their feelings about what “everybody knows” based on what media tells us to believe. The group responded to me much more pleasantly than I had expected wrt to truth verses emotions. One guy from England stated “Trump would annex the south pole” to which I responded, “based on what reasoning?” and then followed by my statement, “I love my president”. Later we talked in detail… pleasantly and he agreed that media spewed small truths in clever ways to spread complete disinformation. E.g. : “thousands of people die at Fukashima…” (TRUE); “Background radiation 5 x evacuation level surrounding Fukashima” (TRUE)… but very surprised to learn that also true no one died from radiation exposure… or arguably a couple could have received high dose inside plants as first responders. And also surprising that the background radiation around Denver is about the same, and the cancer rates are lower than average there. So we are left with questioning what is the media’s role in misinforming people on truth? Head-scratching seeds planted. Big surprise about what they believe and why they should be more critical thinkers. Another Candian guy believed in authority surrounding CO2 and extreme climate… I had several revealing “media” conversations with him during the trip. He did not understand that climate was NOT more extreme until after our talks… He had no basis of understanding and admitted that if I were correct in my claims that warmer climates should scientifically produce less extreme weather. But he tended to attempt to go to the catch all phrase that “we should at least believe the experts”… I asked what the experts said? He said “IPCC are experts” I followed with, “Have you actually read the summary reports for policy makers and more importantly the actual reports?” “no” Did you know that the IPCC charter was to prove (a predetermined belief), that man is causing global warming (earliest reports) and now (more recently) climate change” NO. Well did you know the only proof beyond the theoretically true 1C warming from doubling of CO2, is the climate models (which are tuned based on ECS)?” No idea. I explained why the so called “proof is from the models” which are to predict then later project double to quadruple the actual warming… ? I concluded the reason they are flawed is that observational (real) ECS is closer to zero rather than mild positive to strong positive feedbacks. Eye opener –Seed planted. Further, and that no one was aware that the benefits of CO2 resulting in a perhaps man-caused greening of the planet by some >20%…. Again for argument’s sake, I said I assumed that most of the CO2 increase was not natural but from man burning of fossil fuels. It is not, but I conceded the worst case to make some inroads. I was less contentious and people thought I was an expert… I was rather well received.